Whenever you feel hungry, just wander around Petaling Street and you will find an abundance of snacks to satisfy your rumbling tummy. During one of my walkabouts, I found this stall selling my favourite apam balik(RM0.50 for one piece) made with coconut milk slightly flavoured with pandan leaves. 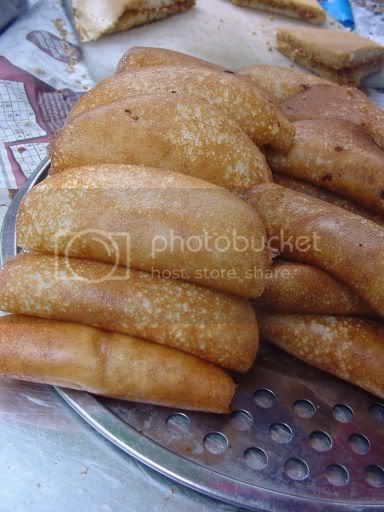 It has fresh coconut shreds mixed within it making each bite a fragrant one especially when eaten warm or piping hot. 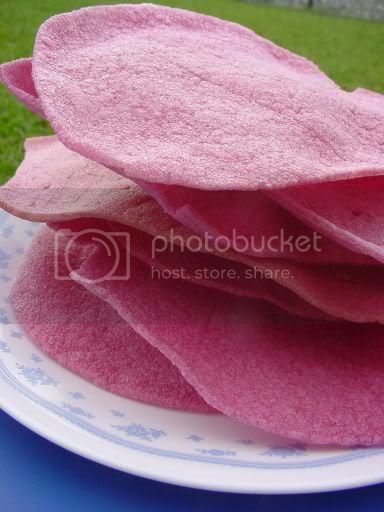 The apam which is also known as the Malaysian pancake comes in many forms and this particular one is known as the Chinese version. The pancake is cooked in small pans where the outside is crispy and the inside is nice and soft. It's then quickly folded into half when it's taken out from the pan. Sometimes, slices of bananas are added in between the apam. The stall also serves another version of apam balik which is more popular as it's filled with crushed peanuts (RM0.50 per slice). 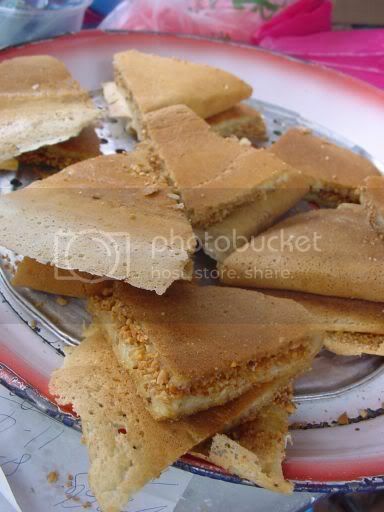 This is similar to the crispy peanut pancake known as Ban Chean Koay in Chinese except it has a softer texture. It's usually cooked in a large pan. 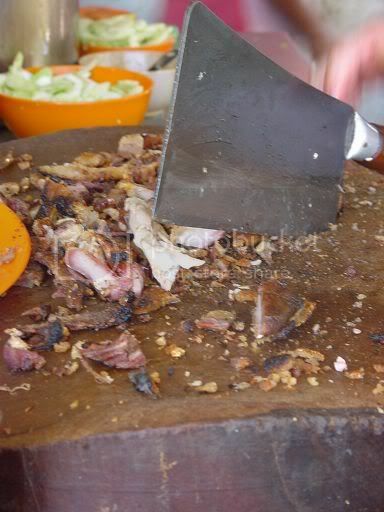 Once it's cooked, it will be divided into slices to be sold. I am always on a lookout for good food hence I decided that I will drag myself out of bed early to savour the Woon Chai Koh at this place which is said to be the best in Petaling Jaya. Previously I have been unsuccessful in trying it out as it is always sold out by 9 am onwards. 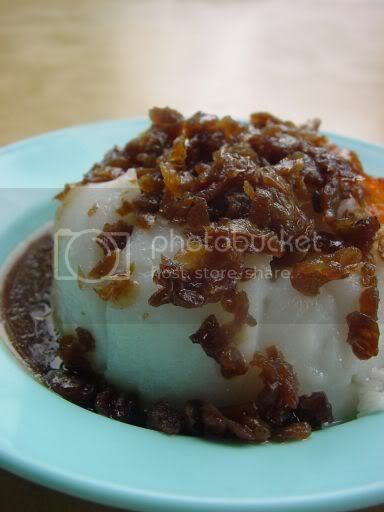 Woon Chai Koh which is what we term it in Kuala Lumpur since everyone speaks Cantonese is actually steamed rice flour cakes topped with preserved radish. 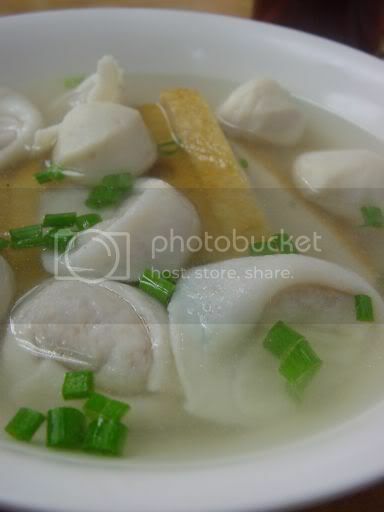 The term Woon means "bowl", Chai means "radish" and Koh means "Cake" in the Cantonese dialect. In Singapore, they term it differently as it is known as Chwee Kueh. Was my efforts worth it? Not really as I found the Woon Chai Koh below par since it was not as firm as I like it. The texture was sticky and too soft. The topping of preserved radish was also not crispy enough for my tastebuds. For me, the ultimate Woon Chai Koh has been the one located at the Tiong Bahru hawker centre in Singapore where the texture is just right with the crunchy topping. Aroma Cookery has blogged about this place and even included her own version that looks great. Anyway, I will continue to search for the ultimate one in Kuala Lumpur/Petaling Jaya but if you have any pointers on where I can get nice ones, do tell as I'll give it a try. Don'cha love the bright purple colour of these crackers? They're made from the ever popular Japanese purple sweet potatoes which have recently invaded Malaysia's vegetable stalls. 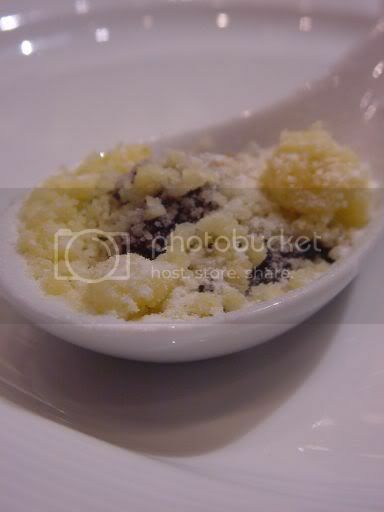 Babe in the City has a picture of the potatoes which she used to make tong sui with. An enterprising person decided to make them into crackers which we got from the wet market. All we did was deep fry them to get these lovely and crunchy crackers. They are extremely nice with a bit of a sweet taste - very moreish. Definitely my favourite cracker now which I am savouring at the moment. If you wish to try them out, we got the crackers from the Seapark Market vegetable seller at the corner i.e. the one that is nearer to the florist. It seems these are home made and get sold out quite fast hence it may not be readily available. Last weekend was a busy whirlwind of shopping for the house since there were sales all over town. Had to take a crash course on shower systems and hopefully I got the right combination of items for my dream rainbath shower. Although we were really busy, we did manage to catch two good places over the weekend. One which I can't blog about as the pictures just did not turn out well so hopefully later visits will yield better results. The other place we stumbled upon when we did quick grocery shopping at Tescos Shah Alam. Being totally unfamiliar with Shah Alam and Subang Jaya eating places, when we were at Tesco Shah Alam, we decided to practise the philosophy of "where the crowd is, the food must be good" theory. Sometimes this theory works really well and sometimes not (especially during peak lunch hours since it could be just bad kitchen planning instead). Since it was almost 4pm when we ate a very late lunch/tea and this JM Beriani place was still packed, we reckon it must be good. Well, the verdict is the food is excellent albeit a bit pricy but then eating nasi beriani is never a cheap affair. For the uninitiated, nasi beriani/briyani is rice cooked with spices and ghee. The rice grains are fried with the spices and ghee to infuse the flavour. It's then cooked and served with various curries of your choice. 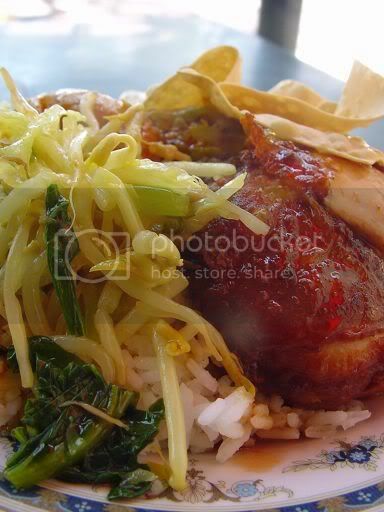 There is a variation of the rice known as nasi beriani/briyani gam which is a Johor specialty. The word "gam" indicates a slightly gummy quality to the food served. To make the "gam" variety, the meats and rice is cooked seperately first and just before it's cooked completely, it is steamed together in a banana leaf and muslin cloth. 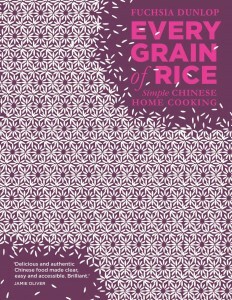 This steeps the rice with the spices from the curry making it sticky and full of flavours. Both of us had nasi beriani, Splashie Boy's was chicken(RM8.50+) while I had the mutton variety(RM9+). 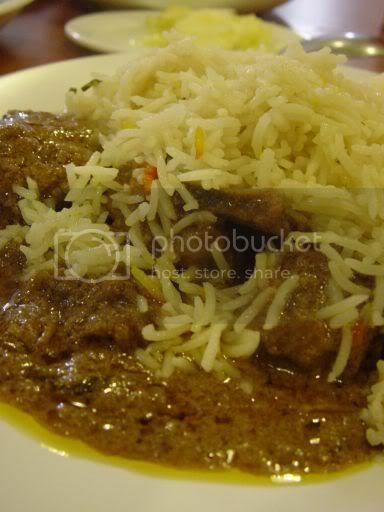 We love the fragrant rice which they used basmati rice grains that came piping hot. The curries which accompanied the rice was very good too and the meats were tender. Sorry for the not so great picture as they usually serve everything in one plate unless you specifically ask for it in seperate plates. They also give you plates of refreshing fresh pineapple to accompany the rice. 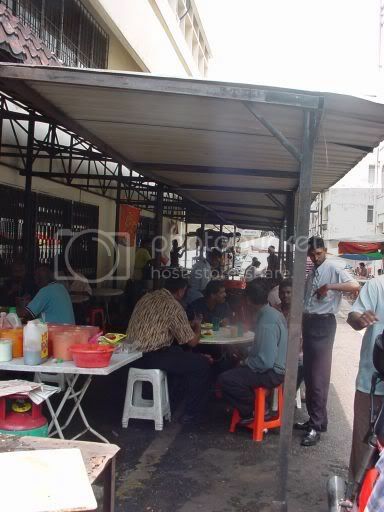 Besides nasi beriani/briyani, they also serve Mee Bandung, Taufu Bakar, Rojak and etc. The taufu bakar (grilled tofu pouches) must be good too as it was ordered by almost everyone at the restaurant. I understand this is not their only outlet as they also have a shop around Subang Jaya. We kinda figured out the JM stands for Jamilah and Mustapha, the names of the owners. 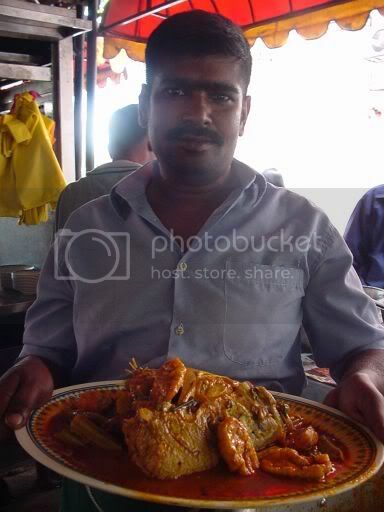 Besides the normal variety of nasi beriani/briyani, they also serve the "gam" variety. The Nasi Beriani/Briyani Gam Chicken is served on Wednesdays while the Mutton variety is served on Saturdays. Update: I found a review done by the Sun paper on their restaurant in Subang Jaya. Check their history and also pictures of their other signature dishes. This month, Too Many Chefs challenged us with the theme of "Make it in 30 minutes" for IMBB. I must admit, I almost forgot about the IMBB event until the last minute plus I was really so busy the whole weekend. I only managed to get this cooked on Sunday night but wow, it blew me away on how absolutely tasty and easy it was to make it. 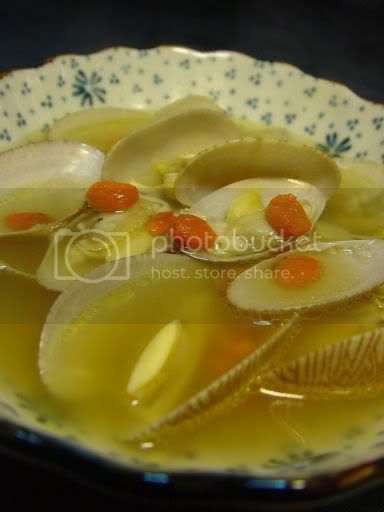 This dish is pretty popular in local seafood restaurants where the serve the clams in a soupy broth. Some versions have more Chinese herbs in it making the broth more flavourful. I used medlar seeds (kei chi in Chinese) which is said to help improve one's eyesight. For the chicken stock, you can use pre-made chicken stock (I usually keep some in the freezer for cooking purposes) or just any instant stock will do. Just make sure it's the MSG free type as you don't want to be thirsty the whole night from the MSG after effects. Hope you'll try it at home as it's really simple to whip a large plate of clams whenever you have the urge to eat some seafood. I didn't keep a timesheet but I did take shortcuts such as boiling the water ahead in an electric kettle while I kept a pot with some water to heat on my cooking hob. The cooking of the clams was also done simultaneously with slicing the ginger shreds to cut down time. Blanch the clams in boiling water, remove and rinse to get rid of the fishy smell (if any). Set aside. Heat up two tablespoons of oil in a wok and fry the shredded ginger until fragrant. Pour in the chicken stock, medlar seeds and salt and pepper according to your taste. Leave it to boil, then turn down the heat to allow it to simmer for about five minutes. Add in the clams and cook it on high heat for a while until they open. Before dishing up, add the Shaoxing wine and mix. Serve piping hot. Sorry for the very late posting of WCB this weekend but we have been busy plus the internet connection has been wonky lately. Life has been super boring - sleep, play, eat, sleep, play and eat. 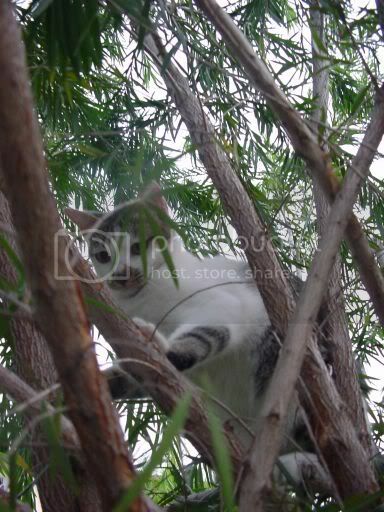 Occasionally we kitties do strange things to perk up our mundane lives like climb trees! The two kitties decided to climb the willow tree at the other house - first, the grey and white kitten thought it'll be fun one evening. 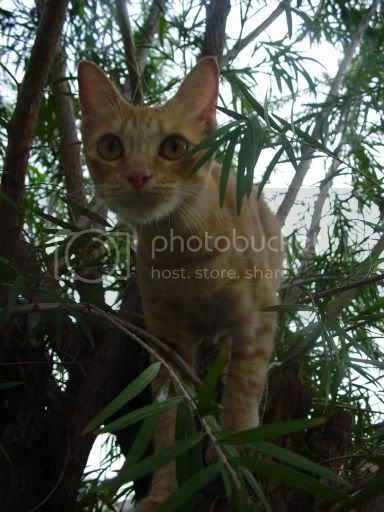 When G saw him up there, being a dutiful cat she is, she followed him up there and joined in the fun. P/s check my kitty friends pictures at eat stuff including my pal, Kiri who has been looking after his mummy when she has been sick with flu. I decided to try out the herbal jelly or gwei ling go at Koong Woh Tong one day in Mid Valley Megamall after reading eatinout's blog entry about it. My first time trying this place which has been in Malaysia for almost 20 years. The herbal tea shop originated from China and has branches in Hong Kong, Singapore and Malaysia. Nowadays they are located at most major shopping malls and their flagship outlet is at Petaling Street. 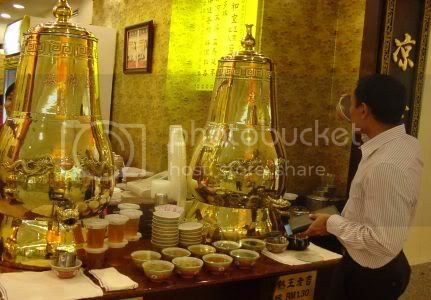 Each outlet has the same design, where two big "gold" containers are placed in front with the two types of herbal tea. You can pour out a fresh bowl from the container and quickly drink it just like this guy. Alternatively you can take away the herbal tea in the pre-packed plastic cups. There are two kinds of herbal tea served: a sweet and really bitter one. Don't ask me the chinese names as I am clueless about all this. I had one bowl (RM1.30) which I asked the lady to recommend due to my flu, she gave me the bitter one which took me a while to finish. The herbal tea is cooked offside and they deliver the tea in large metal containers which the ladies manning the stall will distribute to these containers to keep warm. 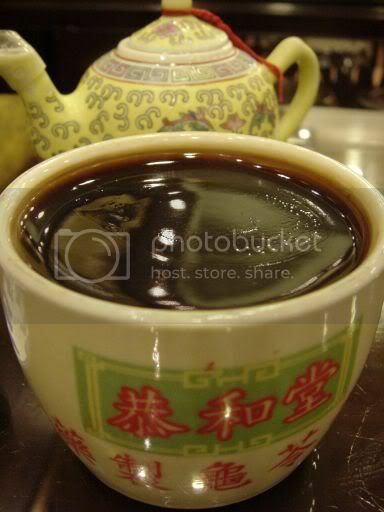 Besides herbal tea, they also serve herbal jelly known as gwei ling go in ceramic pots (RM6 for a small one). When you order the jelly, they will serve it with a teapot filled with a diluted honey syrup. It needs to be diluted for you to mix it with the bitter jelly. This version is not too bitter and nice as it is chilled. You can also opt to have it warm. Gwei ling go is said to be made from turtle shell which is grinded to a powder hence the name gwei which is cantonese for tortoise. The jelly also has numerous herbs and is said to help prevent sickness and relieve body heat. Cha Xiu Bao has an excellent write up of the jelly especially the different ingredients that it is made from. At the side of the main entrance, there is this huge pot which has tortoise figurines on top of it. The pot helps to keep warm the gwei ling go for those who prefer taking it warm rather than cold from the fridge. Ever since a friend of mine asked for a banana cake recipe, I have been looking for a good one to pass on to her. I finally managed to get out the family one which we used to make in a round ring cake tin. It's extremely simple since it uses a one bowl method and idiot proof (I think) since all you do is mix the ingredients. Mine turned out pretty nice except it was not moist enough as I used the wrong egg size - my mother could not remember if it was three medium or large eggs, it turned out to be 3 large eggs. 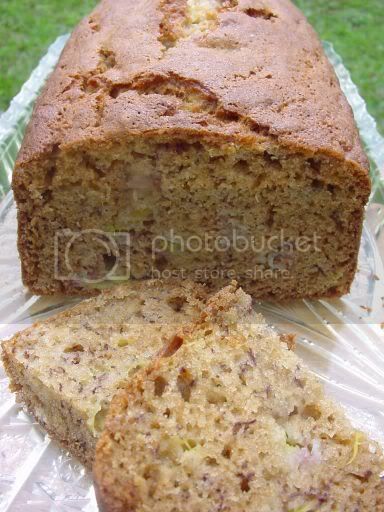 The best thing about banana cake is you need to leave the bananas to ripen a while for it to get really nice and fragrant so it's ideal for using up leftover bananas. Nothing also beats the lovely smell you get when you are baking it. We are not too sure about the origins of the recipe but it seems to have been passed from a friend to my mother. Note how ancient it is as it still uses ounces rather than metric measurements. Butter and flour the cake tin. Mash the bananas in a measuring cup. If you like pieces of bananas in your cake, leave some bigger pieces intact. Mix the egg and sugar in a bowl until it is well mixed with a hand beater. Sift the flour, soda bicarbonate and salt together. Add mashed banana and mixed egg to flour mixture and mix together with the hand beater. Pour into the prepared cake tin. If using the round ring cake mould, bake for 40 minutes at 180C. I used a loaf pan which took about 50 minutes at 180C. Test the middle of the cake to check if it's cooked before removing from the oven. Yesterday, since I had to make a trip to Bina Warehouse to buy the kitchen sink (which cost a bomb! 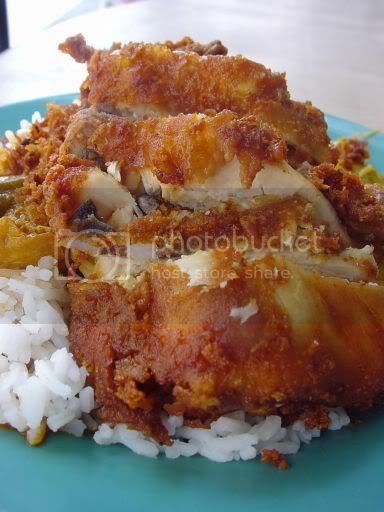 ), I could happily enjoy my favourite fried chicken at the stall in Kampung Attap. It's been a while since I ate here but nothing has changed and the food is still great plus most importantly, no change to their prices. They are famous for their fried chicken which is crispy and not dry on the inside. Just like the Kampung Attap fish head curry stall, you get rice with vegetables and curry sauce plus the chopped up fried chicken. 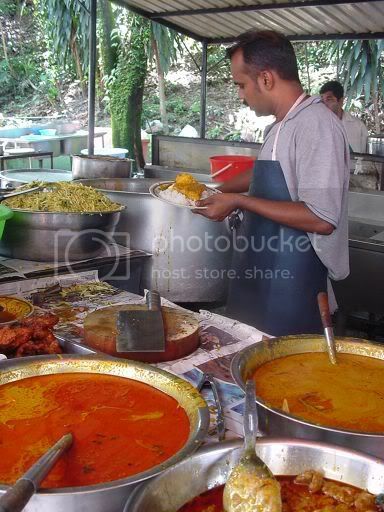 If fried chicken is not your choice with the bird flu scare, you can opt for the various curries they also serve. Usually whenever you go to an Indian restaurant, they would have pre-fried the chicken ahead of time hence it's dry and tasteless. Here they fry small batches at one time and will make fresh ones when it runs out. The place is just a shack at the corner of a road which gets pretty decent business during lunchtime - you get the office crowd, the runners and once I even saw some foreign executives eating here. It's not as packed as the fish head curry stall but they must be doing quite well throughout the years as we heard that the owner who used to drive a van could upgrade his car and even open a branch in Australia. So how much is my plate of fried chicken rice? It's only RM3.50 which makes it a fantastic deal and cheaper than the fish head curry stall. In terms of comparison, I would say the curry they serve at the fish head curry place is much better (more taste) but this place's crispy fried chicken is still my favourite. I have been taking lots of soupy food ever since I caught a nasty flu bug that had me sniffling throughout last week. Once I got better, I started hankering for tong sui (sweet soups in Chinese) for dessert. To satisfy my crazy craving for tong sui, I have been hanging out at this corner coffee shop that has a pretty good dessert and snacks stall. It's advisable to go early to this place which opens from 4.30 pm. Everytime I am at this place it's a hive of activity and popular items get snapped up really quickly by 7 pm. They serve all kinds of snacks here: Yam Cake you see above (Wu Tau Ko in Chinese) which is steamed and sprinkled with fried shallots, fried popiah, glutinous rice, fried mee hoon and etc. Unlike the other tong sui stall I had earlier blogged last year in Section 17, this stall only sells the classic tong sui items such as red bean, wheat, green bean, bubur cha cha, barley beancurd gingko. 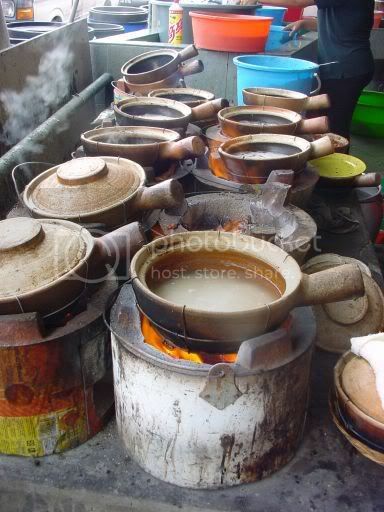 Each bowl costs about RM1.30 and you can get it piping hot as they rotate the big pots on a fire. My favourite is the barley beancurd gingko - not much in terms of ingredients inside the tong sui but it's smooth and sweet. 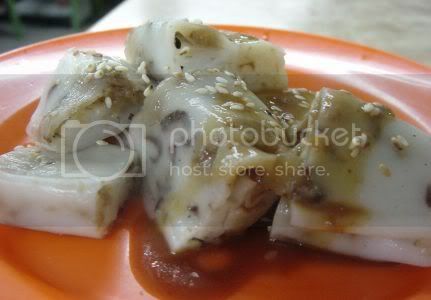 They also serve two kinds of chee cheong fun (rice sheets); the plain ones to be eaten with the brown sauce and the stuffed ones known as Teluk Anson Chee Cheong Fun as it originates from the Teluk Intan(Anson) in Perak. 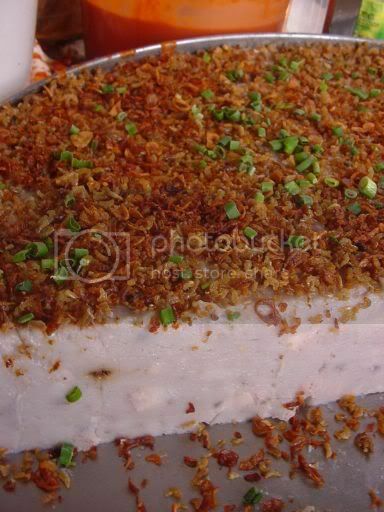 This version has no meat inside it and is stuffed with mushroom slices, fried shallots and preserved turnip. I really like it as it gives a kick to the plain ones with it's crunchy filling. After a weekend of turmoil struggling with the blog - republishing, deleting and slowly freaking out whenever I saw a blank page, I hope Blogger is now back on track and does not dissapear on me today. On to the food which is what matters most to the tummies. Last week, while wandering through the market and figuring out what to cook for dinner, I found fresh water prawns for sale. Although, these prawns are from farms which specially breed them, they are not readily available at the markets. The prawns have bigger sized heads and larger pinchers in front. 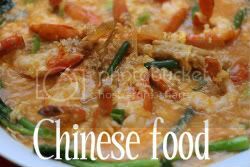 I decided to get some to make my own version of "sang har meen" which is popularly known here as freshwater prawn noodles. Although the ones you get at the restaurant serves the prawns on crispy noodles, I decided not to deep fry the noodles this time since I wanted to keep the fat levels minimal. Instead I used a type of noodle we call yee mee. Tastewise, I thought it was pretty good although my stock could have been richer if I had boiled the prawn shells longer. Think the next time round, I will try the crispy version. 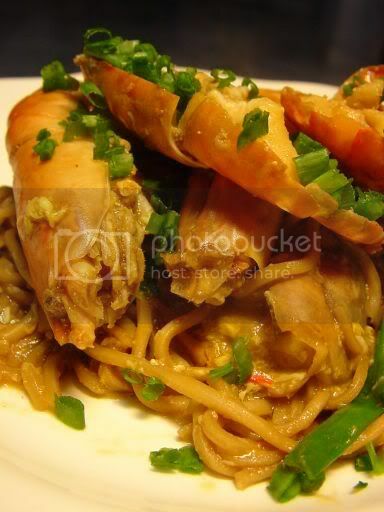 Fry sliced young ginger in a tablespoon of oil and fry the prawns till fragrant. To make the sauce, you can add chicken stock or in my case, I used prawn stock made from left over prawn shells. Season with oyster sauce, light soya sauce and a dash of dark soya sauce. Add the vegetables and yee mee which has been rinsed in boiling water to soften and simmer for a few minutes. You can thicken the sauce by adding cornstarch. Just at the end, add a beaten egg and stir to cook. Dish up and serve hot. For the crispy version, you can try Amy Beh's recipe. A quick WCB post as we hope this can be posted since Blogger has been having problems the whole weekend. 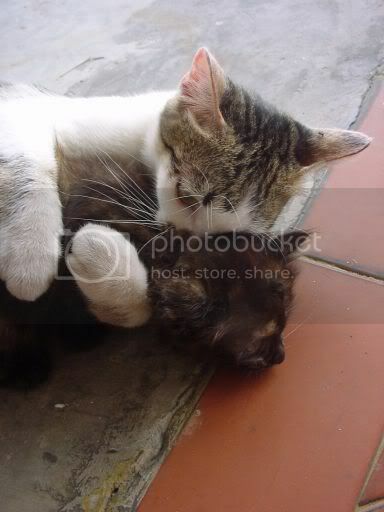 The kittens are all getting along well - see how the bigger one likes to play headlock position with this one. More pictures are found here. Do check out Kiri's new home at eat stuff this weekend. Sorry for the inaccessibility yesterday as Blogger faced a problem with one of their filers which affected a few blogs. To read more about the problem, click here. We revisited the coffee shop right behind O&S yesterday to eat the claypot chicken rice. Actually, it was just an excuse to also get more of the yummy egg tarts! This particular claypot chicken rice seller is a really hardworking fella as he is open from morning till night time taking a break only after lunch for a few hours. You can't see him the above picture but he's constantly behind the row of claypots burning over the charcoal fire all the time as he has to monitor the rice being cooked. Next to the stove is a huge cache of charcoal for him to keep the fire burning. Usually the row of claypots will have various pots cooking the rice at different stages. If you see the first pot, rice and water has just been added. 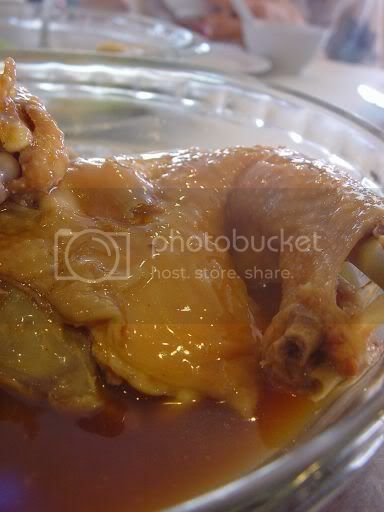 It will be allowed to cook and a nice crust will form at the bottom of the claypot which is the chewy bits I love. 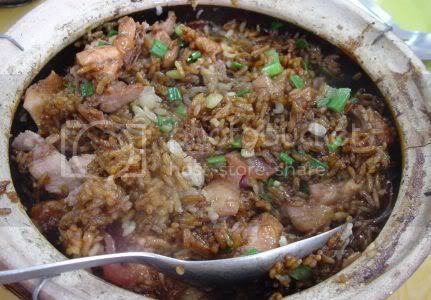 When the rice is almost done, a pre-cooked topping of chicken and chinese sausage in black soya sauce is added. The lid will be placed on top and the topping is heated through for a few minutes before it is served. Once it is served at your table, mix the topping up with the rice and enjoy. I love the rice here as he adds a bit of ginger to his topping. My only complaint is there is too much chicken versus rice but it's a good deal at RM10 for two people. Remember to scrap the bits that stick to the claypot and eat them as they are the best. Opens from 6am to 9pm daily. The claypot chicken rice starts around 7 am to 3pm. For dinner they serve from 6 pm to 9 pm. Yesterday after lunch at O&S, we stumbled upon these fantastic mini egg tarts selling for RM0.60 each at the restaurant right behind O&S. The restaurant recently went through a revamp and now boasts new stalls like the popular Lim Mee Yoke and Robert's Fried Kuay Teow besides their ever popular claypot chicken rice. Freshly baked from the oven, these tarts are sublime as the pastry is nice and crunchy. When we were there just after lunch, the stall owner was making his last batch for the day as he had run out of ingredients. My benchmark for quality egg tarts is Tong Kee which is extra nice because of their flaky layers. These are not as flaky but much crispier than the Tong Kee ones. 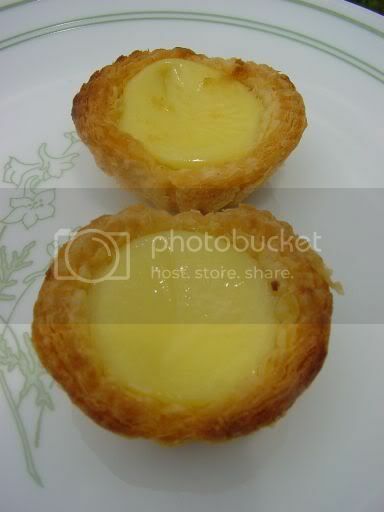 They remind me of the tiny egg tarts sold at Weng Hing, Jalan Imbi but these keep better when they are cold. If you like them piping hot, just pop them into a toaster oven. I often eat at really obscure places and this particular restaurant is one of them. I was introduced to this far flung place by my dad, the foodie in the family. Not sure how he found this place but he took us here a few times for breakfast. Ever since I was a kid, my dad was the one who steered us to roadside stalls to search for good food. If he is in a new country, the first place he visits is the local market so he can check out what is famous and special there. Like all fishball places, you can pick a choice from different varieties of yong tau foo stuffed with fish paste, fish balls, deep fried fish cakes, deep fried wantans and my absolute favourite, the fish skin wantan ( Yee Pei Wantan in Cantonese). I love these which you don't usually get at the stalls but is easily available from the wet markets. 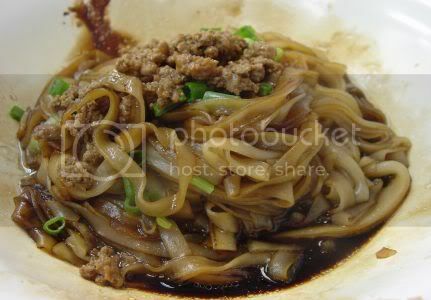 You can also choose from a variety of noodles and since they ran out of my favourite "rat tail" or loh shee fun noodles, I ordered kuay teow tossed in soya sauce and sprinkled with minced meat on top. A thousand apologies in advance to my Muslim readers but this is very much a non-halal post. It amazes me that this little place just off Jalan Kuchai Lama does not get much coverage since they serve one of the best siu yoke in town. Maybe those who know about it just want to keep it as a secret. As far as I know, only Charkueyteow.com has talked about this particular place. In a coffeeshop tucked in a quiet neighbourhood, there is this corner shop that is packed to the brim during lunchtime. Everyone comes here to savour the siu yoke which comes out around 11.30 am piping hot with a crispy skin. It is rumoured that the fella who runs this stall used to be a professional accountant who gave it up for this lucrative business. I for one am very glad he did that as his siu yoke has a real melt in the mouth quality topped with a crispy skin. 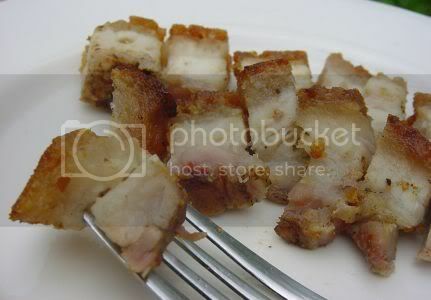 Although he serves other roasted meats, they are only passable as their best seller is the siu yoke. Go early to get a plateful of the best bits and before it runs out. If it wasn't for my aunt who lives in Taman Desa, I doubt I would have discovered these people. Opens from 11.00 am till 3 pm. Closes on alternate Mondays. Last Friday, we did a lot of indulging at the wonderful Hotel Maya. Splashie Boy was invited for a seminar organised by the big M in the afternoon and they were so sweet to include the partners as well. While they worked, a few of us got to indulge in a luxurious massage at the spa. 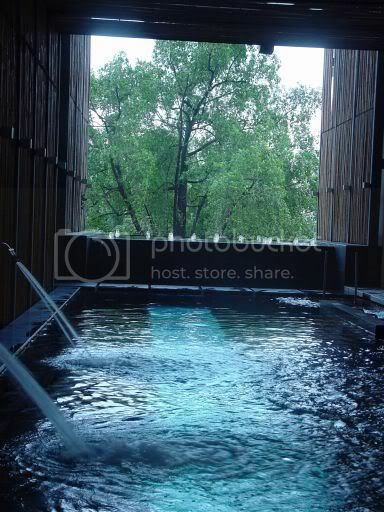 The hotel had recently revamped itself and it's now touted as a "boutique urban resort". I love their new look with pools of water, crystal lights blinking and their impressive iron wrought spiral staircase. They are also famous for this hydrotherapy pool which is heated and said to help massage your body for a rejuvenating experience. Once the serious work was done, there was a cocktail reception for everyone to relax and get to know each other. Then it was back to the ballroom for dinner accompanied by a quartet of musicians. It wasn't Hoobastank singing the Reason but they were really good and extremely romantic. We started out with appetizers that you can help yourself. Since everything was yummy and the pictures turned out great, I'm featuring each one rather than resizing them smaller. First appetizer was the yellow fin tuna on vermicelli noodle salad. 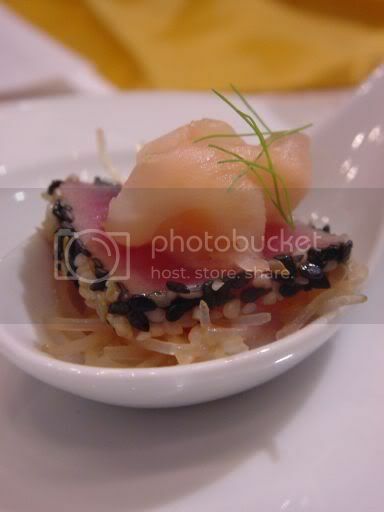 The tuna was slightly cooked on it's sides and sprinkled with black and white sesame seeds. Pretty good especially with slices of gari (pickled ginger) on top of it. Hotel Maya's Still Waters restaurant is famous for Japanese sosaku ("creative") cuisine which is a fusion of Japanese traditional dishes with modern Australian, French and Asian. One of it's signature dishes is this California summer roll with dipping sauce that has prawns, crabmeat, avocado and lettuce wrapped in nori and Vietnamese rice paper. 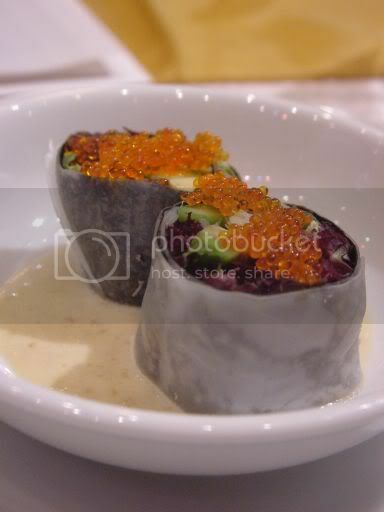 It's topped with flying fish roe or tobiko and each bite is heavenly. 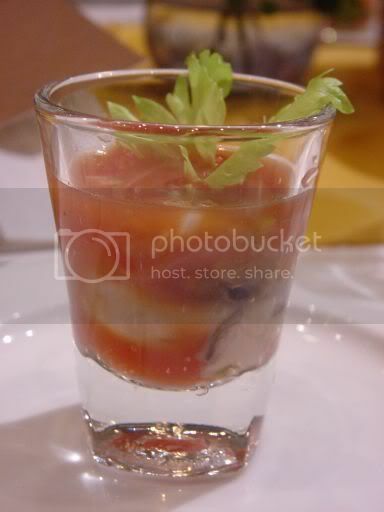 We all liked these cute pacific oysters in bloody mary shot. Pop them into your mouth for a shot of ooomph to start out your weekend with a bang! Someone on our table had quite a few so I guess he's having a great work out during the weekend. 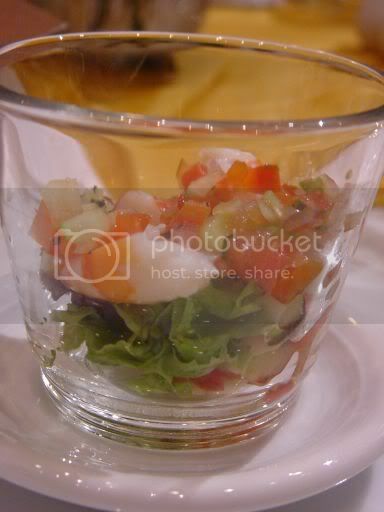 Last appetizer of the night was the prawn salad with gazpacho salsa which did not impress us much. It was pretty bland although the prawns were fresh. Next course was the Cream of Yellow Pumpkin with sun dried tomato paste swirled in it -extremely nice and filling. Then we had a scoop of icey cold lime sorbet to clear our palate for the main course. The main course was a choice between two items - the beef and fish. I had the fish which was grilled salmon served with black truffle sauce (see those teeny black bits on the fish, its the truffle shavings). 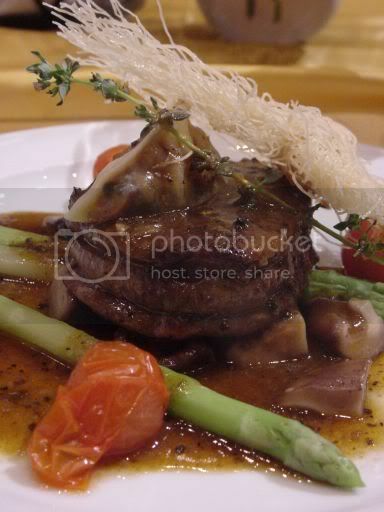 It was served with cherry tomatoes, asparagus spears and braised shitake mushrooms. 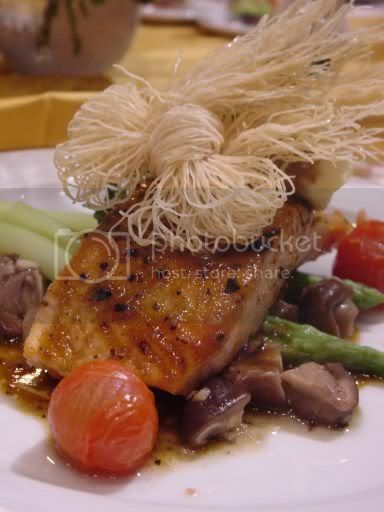 Another plus point was the duck foie gras gyoza placed on top of the salmon. You can't really see the gyoza in this picture as it's hidden by the vermicelli decoration. My salmon was cooked just right and everything was sublime. Splashie Boy had the grilled beef tenderloin which came with the same items. Here you can see the duck foie gras gyoza on top of it. The beef was slightly dry but the wait staff went around with extra sauce. One thing I must mention, the hotel does superb chocolate pralines. I had a dark chocolate one during the cocktail which was filling with a wonderful plain chocolate filling. For desserts, we were given platters of chocolate pralines of different flavours. The white ones had a lovely peanut butter filling while the hazelnuts coated in chocolate at the far end were also great. I was quite full from the main course so I nibbled on the desserts and fruits. 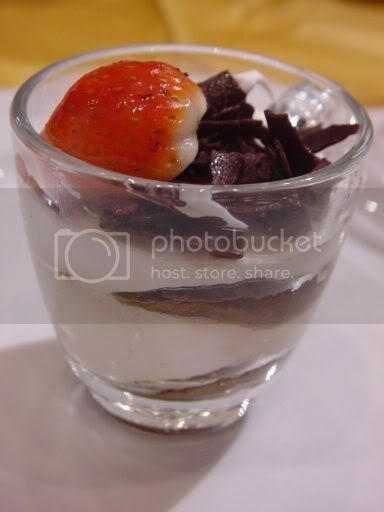 They served a mini tiramisu topped with half a strawberry and chocolate shavings. It was more cream versus cake in the tiramisu. There was blueberry crumble on a spoon which was dissapointing. The blueberry reminded me of the fruit topping I get from bake shops that was topped with a crumbly biscuit topping. This was my least favourite of the whole dinner. 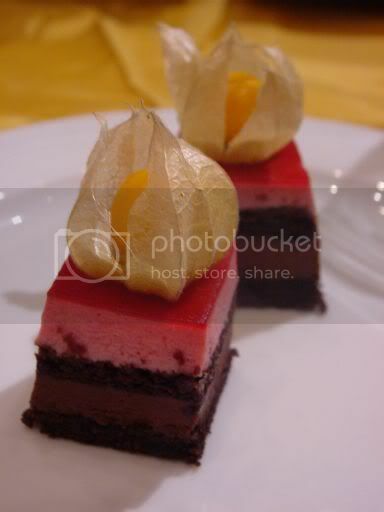 The raspberry and chocolate mousse cake came topped with a pretty cape gooseberry. I love these gooseberries with their little brown cape and their bright orange colour. The cake was interlaced with chocolate sponge layers which was very nice and light. Thanks for the lovely time Big M.
My house is turning out to be a cat shelter! 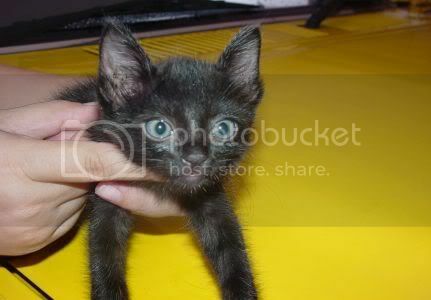 On Thursday, Mum came home and found a black kitten at the house porch. No idea how it wandered in and from where as there are no other kitty cats around the area. Maybe someone brought it to the house as they knew we love kitties. It's a little fella - black in colour with a tuft of white hair at it's chest. It's sleeping in the cage and Mum is stuffing it with lots of food. It plays quite well with the other kittens but since they are bigger than this little fella they tend to bully it. Mum is starting to send all of them to kitty boot camp i.e. wean them from their mummy, eat by themselves and learn how to use the litter box. Hopefully they learn quickly so they can get adopted as soon as possible. P/s go over to eat stuff to see my kitty pals including Kiri de Man! This month's theme for SHF is all about dairy i.e milk, cream, yoghurts and cheese which is hosted by Spittoon Extra. 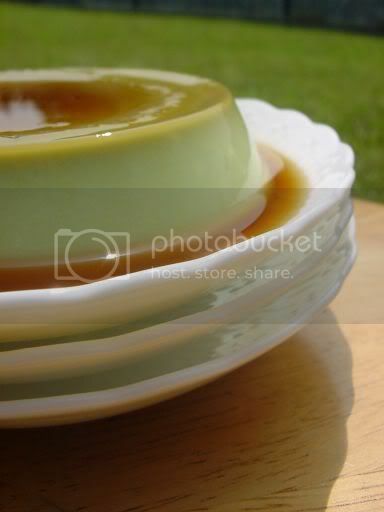 As I love working with local ingredients, I decided to try making Pandan Pudding served with Gula Melaka syrup. 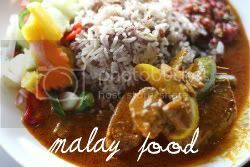 The recipe is from a famous Malay restaurant in town. The pudding is akin to a panna cotta and rich with milk and cream making it very sinful eating. It's extremely easy to make and you get perfectly formed puddings by using heat proof plastic moulds. Although the pudding looked great with it's light green tinge, I thought the taste was a bit flat and uninspiring. If it wasn't for the gula melaka syrup, it would have been a disaster but the syrup helped give it flavour especially when you add lots of it. I'm not sure why the taste is not great but it could be due to my usage of pandan leaves versus the stronger tasting and artificial pandan extract. 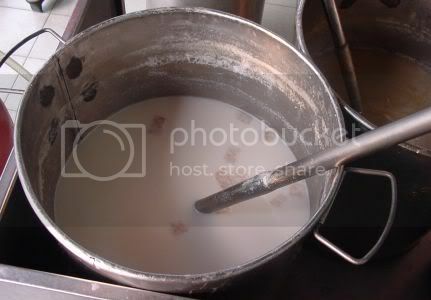 In a small stainless steel saucepan over medium heat, slowly melt the palm sugar in the water. Do not stir, but swirl the saucepan from time to time to distribute the heat, until the caramel turns golden brown. Pour the caramel into the base of your moulds. Do this carefully and at arm's length as the hot caramel may splutter. Set aside. Blitz 350 ml of the milk and the shredded pandan leaf in a food processor until roughly combined. Pour the mixture into a saucepan. Soften the gelatine by sprinkling in over 1/3 cup of remaining milk, let it stand for 5 minutes. Add the rest of the milk, the cream and the sugar to the saucepan with the pandan milk, add the softened gelatine and simmer gently stirring constantly for about 15 minutes. Remove from heat and allow to cool slightly. Strain the mixture through a muslin cloth and pour into a jug. Pour into moulds and refrigerate until set. When ready to serve, place serving plate over moulds and with a firm short shake, puddings would slip out easily. Update: Spittoon has done the round-up which is in a cool format - you get to see where the entries come from all over the world. Do visit and indulge in the worldwide dairy entries. Since it's Friday, I thought it should be appropriate to end it with what we usually eat on Fridays when things wind down for the weekend. This little shack under a canopy of shady trees was introduced to us long long ago by one of our clients. It's a great place to have a really good budget meal and best of all, excellent to get to since it's just off the highway. I love the Kampung Attap area which isn't really a kampung as you don't see village houses like Kampung Baru but was known instead as an area for police accomodation. Although the area is very run down, I often go there as I have two favourite stalls: this one that serves yummy ayam madu (Malay for honey chicken) and fish head curry and another one that serves excellent fried chicken. Another plus point about Kampung Attap is the excellent frozen food specialist, Lee's Frozen Food which sells all kinds of frozen meat and seafood at reasonable prices. The stall has been in business for almost twenty years and moved in to this premises since 1992. Usually you queue up and order your food from this man who will cut the fried chicken for you and pour the sticky honey sauce flavoured with spices. If you are not eating chicken due to the bird flu scare, you can also choose from large squids, fried fish and mutton curry. I had a plate of ayam madu, my favourite which comes with two kinds of vegetables: the curry vegetables which is taken from the same pot of the fish head curry and the bean sprouts and spinach. You also get a handful of crackers with the meal. Excellent stuff which only set me back by RM4.20. 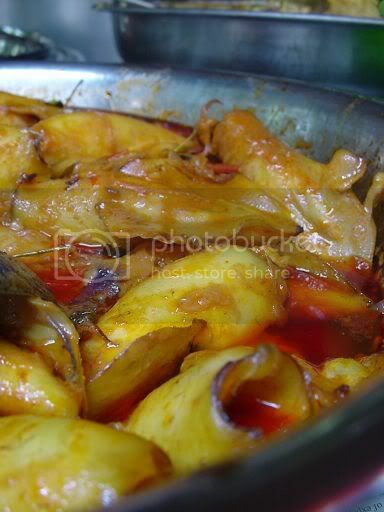 Sometimes when I am not in the mood for chicken, I'll reach out for these lusciously yummy squid cooked in a curry sauce. 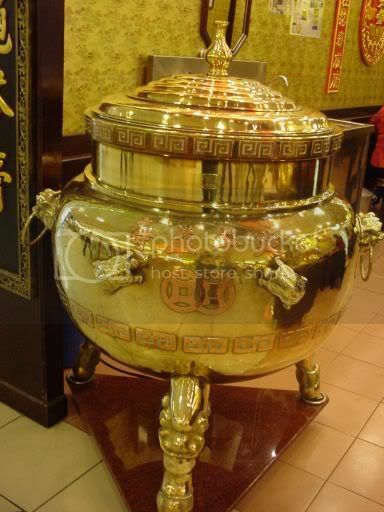 The fish head curry and vegetables are all cooked in this enormous metal pot. Every day they cook approximately twenty to thirty fish heads. If you come late, say by 2.30 pm, you will see they have sold out everything and the huge pot is empty. The enormous fish head curry (order only when you have a horde of hungry friends with you) is from a large type of fish known as ikan merah in Malay (sorry I have no idea what it's called in English) and each plate costs about RM40 (price may vary due to the size) . 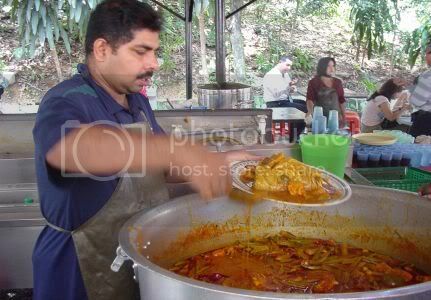 The guy who ladles up the fish head curry is a real expert as he fishes inside the large metal pot to dig out the fish head which is hidden by the vegetables in the curry. I spied these recently when I was stuck at Jalan Imbi and thought I will take a break from sitting in the traffic jam. Weng Hing is a famous corner coffeeshop along Jalan Imbi that serves yummy pork noodles and char kuay teow. My niece loves the pork noodles here and will always ask for it to be ta pau (Chinese for pack back home) for her. Must blog about the famous noodles one day. Last week, Kate from Pie in the Sky made a comment about the sugar cane juice she found in Ecuador hence I thought she would be interested to see how Malaysians make their juice. 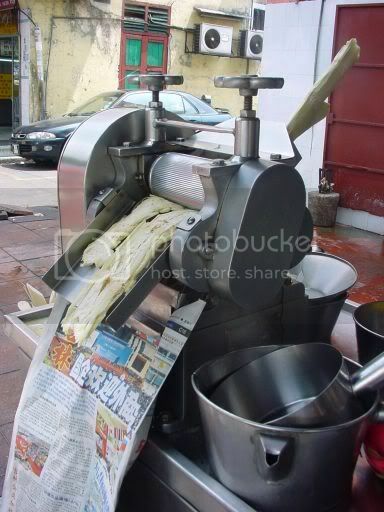 The stripped sugar cane is placed inside the machine which will automatically press the juice out. I found an interesting fact about sugar cane juice - you can distill the juice to make ethanol which is used by the South Americans as cheap fuel. Only found this nugget of information last night when I saw the latest episode of Amazing Race as one of their tasks was to make ethanol for their car in Brazil. 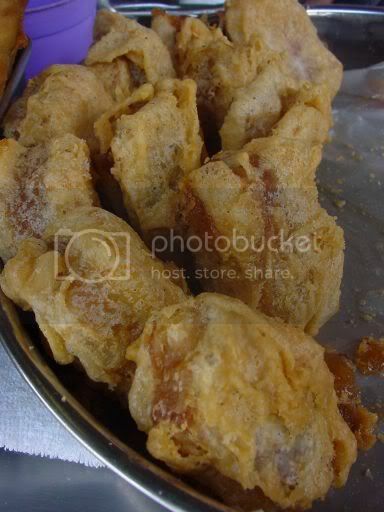 The stall also sells fried snacks like pisang goreng (Malay for banana fritters), fried popiah and kuih bakul. I didn't manage to get any banana fritters as it was sold out but they still had kuih bakul. 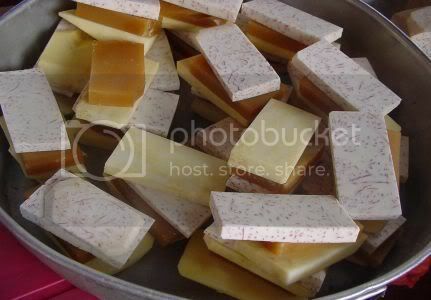 Here you can see the three layers of kuih bakul: yam, nien gao and sweet potato. 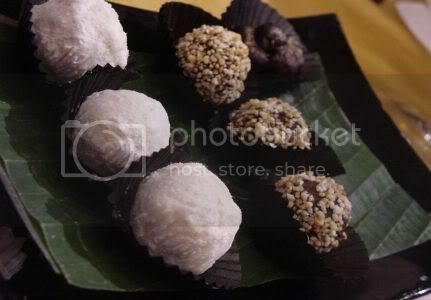 Nien gao is a sweet sticky glutinous rice cake which is popular during Chinese New Year. 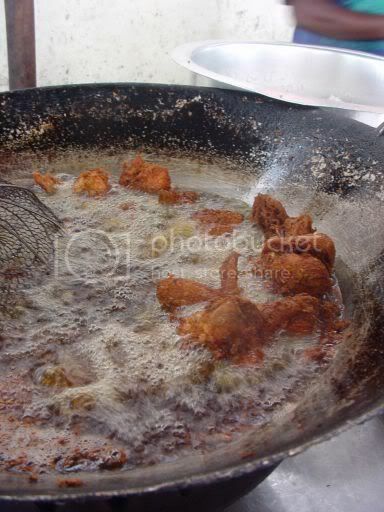 Once the three layers are assembled, it's dipped in batter and deep fried in hot oil. You get the crispy layer on the outside with the soft yam and sweet potato layers accompanied by the sticky nien gao which taste great. Sorry about not posting yesterday. I had this all ready and resized but did not manage to do the write up the whole day as I was out. On to the food which is what matters to our rumbling tummies. Recently my family had lunch at this restaurant that we often go to around Paramount Gardens. It's a popular haunt for everyone in the family especially for family occasions as they serve pretty good food at reasonable prices. This is my mother's favourite dish, the steamed "fei chou" or ikan talapia with a spicy bean paste sauce (RM30++). The restaurant seems to have perfected this dish as they always get the fish just nicely steamed and the bean sauce is not too salty. I can definitely vouch for their consistency as we always order this dish until Splashie Boy got so sick of eating it. 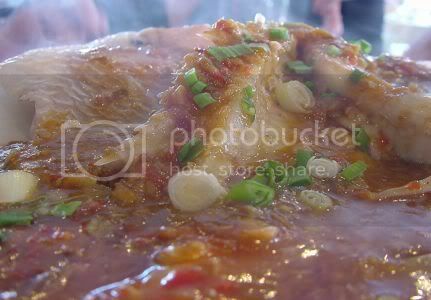 Although the fish is not the expensive kind, if steamed just right, it's really yummy. 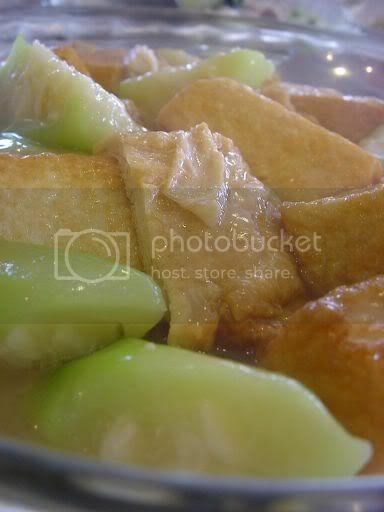 Another must have we always eat is the braised bean curd and hairy gourd (RM15++). This time round the hairy gourd was a bit old and fibrous but the bean curd was nice. This is my personal favourite, siu pak choy (Chinese for small white cabbages) cooked with yam cubes and dried shrimp (RM12++). 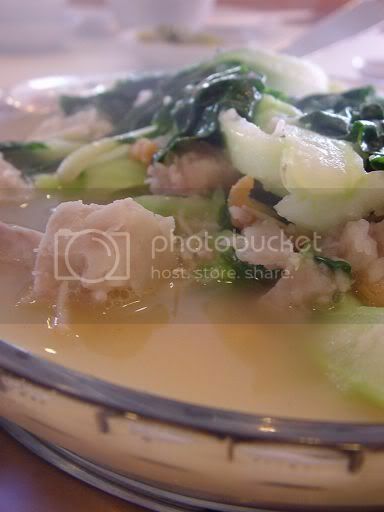 It's a take of the siong thong yeen choy (Chinese for spinach in anchovy soup) which uses yam cubes to make the stock. 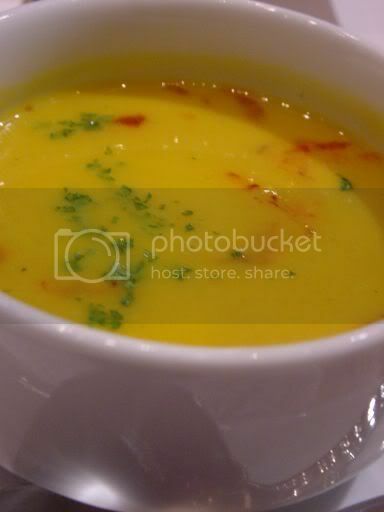 The dried shrimps add flavour to the soup. We also ordered the herbal chicken (RM28++) which wasn't too fantastic that came in a thickish brown sauce flavoured with the herbs. If you wish to eat here, you can also order from their pre- set lunch and dinner menus that offer value for money.